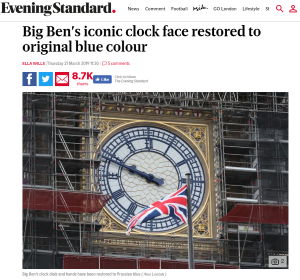 As surrounding scaffolding was removed from the North Dial, Londoners got their first glimpse of the clock tower’s new look on Thursday. The dials and clock hands of the tower have been painted Prussian blue and gold as part of the restoration, in a nod to the tower’s original design. It had previously been painted black in the 1930s. The colour was determined following extensive research into the Victorian tower’s initial colour scheme, in consultation with Historic England. A major four-year restoration projection began at the Elizabeth Tower in 2017. The tower was originally designed by architects Sir Charles Barry and Augustus Welby Pugin and completed in the 1850s. The landmark was silenced in August 2017 to make way for the multi-million pound renovation but the clock has since been restarted for national events, such as Armistice Day. The Elizabeth Tower, home to the Great Clock and the Great Bell – known as Big Ben – last underwent significant conservation work in 1983-85.